Weather – not exactly the topic of choice for a blog post, yet it is one that is on my mind. You see, in my part of NY, we expect weather issues in the winter. Ice and snow often keep us home, make driving treacherous, and cause damage to our home. This is not usually true in the spring, summer, and fall. These seasons are relatively quiet most years. Mother Nature apparently decided that she was going to get our attention this summer. Over the last two and a half weeks, it has been wild, wacky, and down right deadly in certain locations. Tuesday, August 23 – The boys and I just got into our car that had been serviced. As I turned the key, the car started to buck violently. The boys did not seem to notice. I got out of the car. This is when I felt dizzy and like my knees were going to go out from underneath me. This should have been my clue, but I was tired and getting ready for a romantic 10th Anniversary getaway with TechyDad. Thanks to Twitter, I quickly learned that what I had felt was not my car – it was an earthquake. Yes, in NY we were experiencing the quake that started in Virginia. Linda Carmical wrote about the social media connection and how word spread. Sunday, August 28 – Hurricane Irene, came up the east coast and left a major impression on regions that were a lot further inland than ever expected. Thanks to this monster storm, we had to cancel said trip to Disney World. Roads were flooded throughout NY, bridges closed, and rivers running into homes that are gone. We were so lucky, but so many others were not. For a few days, the weather was quiet. The sun came out. People started to clean up, repair homes, and move back into areas that had been evacuated by the Mohawk and Hudson Rivers. Then it changed. This seemed to open the rain up to the area again. Monday to Thursday, September 5-8 – Yes, Mother Nature decided to dump more water on the area already inundated with flooding after Hurricane Irene. Welcome the remnants of Tropical Storm Lee. Pieces were not picked up and inches of water were back all this week. Back to school has been gray, rain filled, and nasty. The Mohawk and Hudson Rivers, along with countless other creeks and waterways are over their banks. Watching the reports out of Binghamton, NY and other areas just breaks my heart. At midnight on Wednesday, areas in Schenectady County that had been evacuated during Irene were once again in chaos. People were told to leave immediately as water started to spill into the streets. My heart goes out to all of those who have been dealing with this horrible weather and damage. We will be working on a project to help locals with items that are needed. Of course, I so wish we could bring some of the water to those in Texas. Thanks to the drought that area could really use it to help stop the raging wildfires. Do you recall many natural disasters from your childhood? If you do what were they and how did they change your life? Dare I ask . . . how is the weather by you? I hardly recall any other hurricanes in our area. I remember them going to Long Island and places south of us, but no flooding in our region like this. This week, we are expecting the sun to return, which is much needed. Of course, this flooding will be an on going issue with any additional rain for months. I don’t remember any from my childhood at all. I think we lived in an area that was pretty mild all year round. Though we now live in an area that has tornadoes all the time. I don’t remember any bad weather from my childhood. Although when I was an infant, an F-5 tornado hit Xenia, OH and killed 30-some people. Since we were only 15 minutes away from Xenia, I grew up hearing tales of that tornado. I don’t remember hearing of or having weather like this. Not sure if it is due to the 24/7 news or if it is due to something bigger than all of us. I can remember a tornado when I was about 5 years old. I don’t really recall crazy weather conditions like we seem to be having these days. I remember lots of snow and one hurricane when I was growing up. We are having the same kinda crazy weather here in MD. We felt the earthquake, had Irene come through, tornado warnings, and now all this doggone rain is causing flooding. Nuts! From my childhood, nothing major. I remember Hurricane Gloria (a little) and snow in October, but nothing major. In more recent years, I lived in Florida when Katrina came through (nothing like the Gulf) and when we got hit my Wilma. 1+ weeks without power, and 2 weeks with now school. I feel awful watching all the weather problems on the news. I just keep hoping everyone will be okay, and Mother Nature will calm down a little. i remember the Blizzard of ’78 – in small parts. i have a memory of my dad and i walking through our apartment complex surrounded on all side by very tall walls of snow. and, i remember seeing people cross country skiing down the roads. and now, it’s been raining since Tuesday at my house. it’s just cloudy now, but i think there’s more rain coming. still not sure how Ohio is getting the remnants of a tropical storm. it’s too weird. I remember one hurricane in my childhood. I was amazed how safe we were in that tiny zinc house. And right now the weather is beautiful here. Cool and sunny. Oh yes winter/fall is a coming! Makes no sense what is going on in Texas when other places are getting flooded. We’ve been really in a drought here. But, there is always that January pay back to look forward to. Harriet´s last blog post ..Friday Finally……. 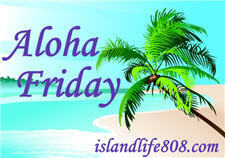 MSRheinlander´s last blog post ..Aloha Friday… Smoke & Ash! I don’t really remember any kind of natural disaster from my childhood. However, it’s pretty hot and humid around here now.